We started the lesson by watching this video and talking about the various shapes and line widths he used. I fast forwarded and paused the video as we watched so we could talk about the paintings. This video was great because it showed the progression from more realistic works to the very abstract. 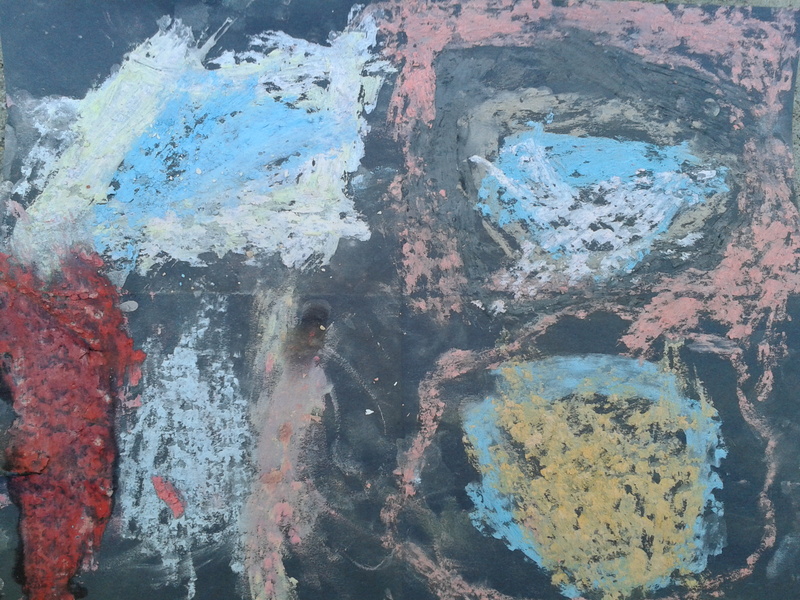 We identified the objects and shapes in the realistic and abstract works. 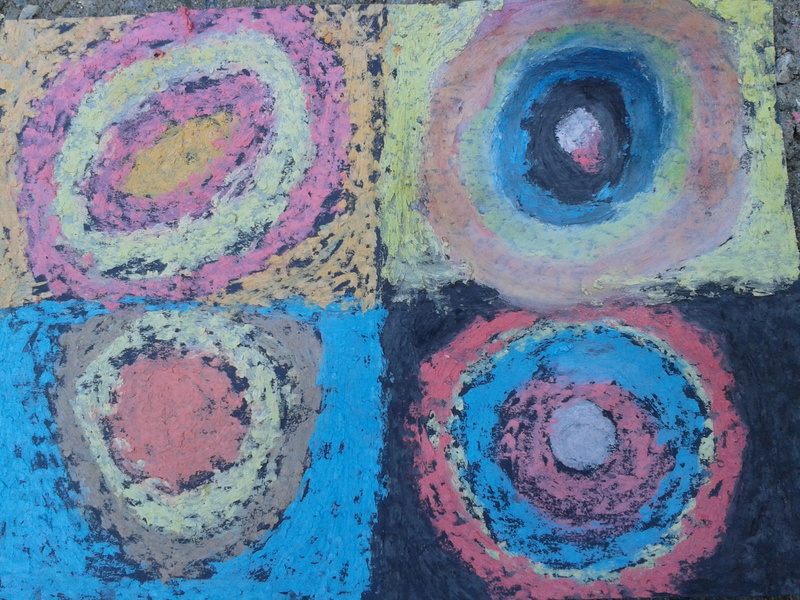 I had watched a lesson plan video earlier and decided, in keeping with my homeschooling on a dollar store budget, that we would use wet chalk instead of oil pastels. I folded a piece of black construction paper into quarters. This resulted in rectangles instead of squares, but you could easily trim a piece of paper down before you folded it. We went outside for art because the littles woke from nap before we started and I didn’t want chalk all over the house. 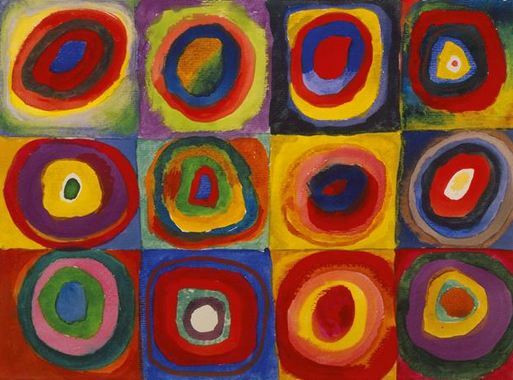 I kept a picture of Kandinsky’s work up on the laptop as a reference. 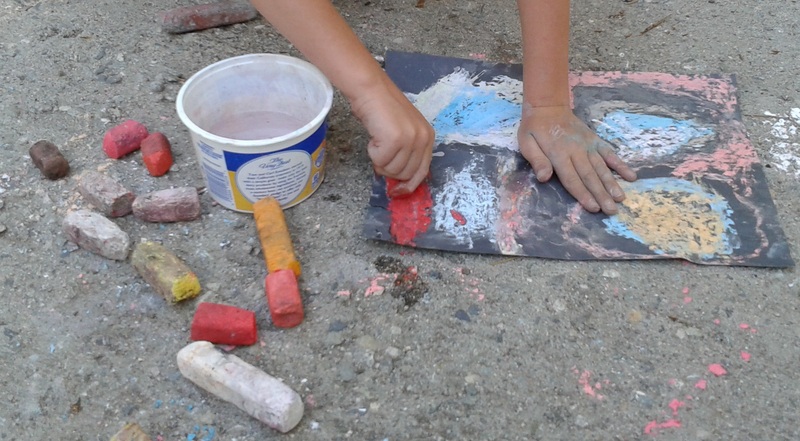 I showed them how to wet their chalk before using it to achieve a deeper color. After we filled in two sections, I showed the boys how to blend colors to make new colors. There were so many “lessons” in this simple activity: types of art, shapes, colors, color mixing, art mediums, textures, and on and on. I am not using a set curriculum for math this year. 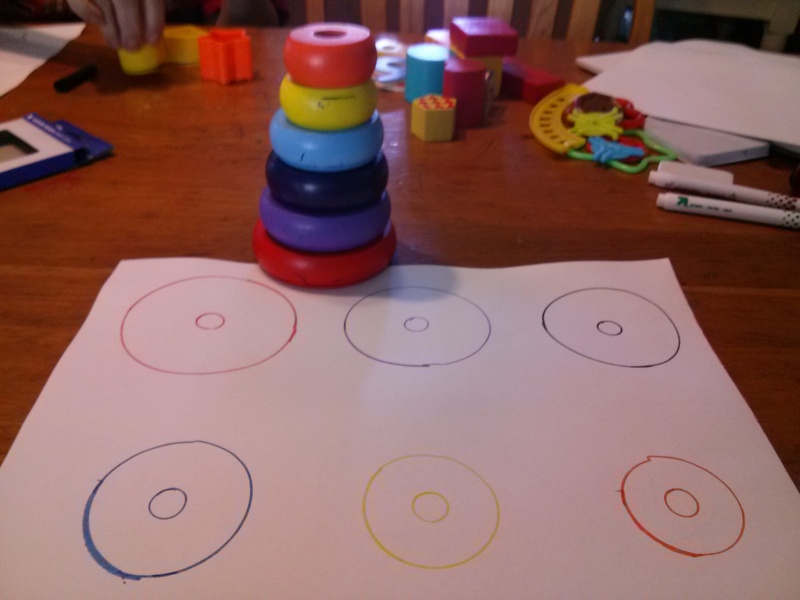 My plan is to use lots of hands on activities and then work through addition and subtraction using the cognitively guided instruction approach. I am excited about this approach as it is highly recommended by a long time elementary schoolteacher and teacher trainer. I will post more about that later in the year. 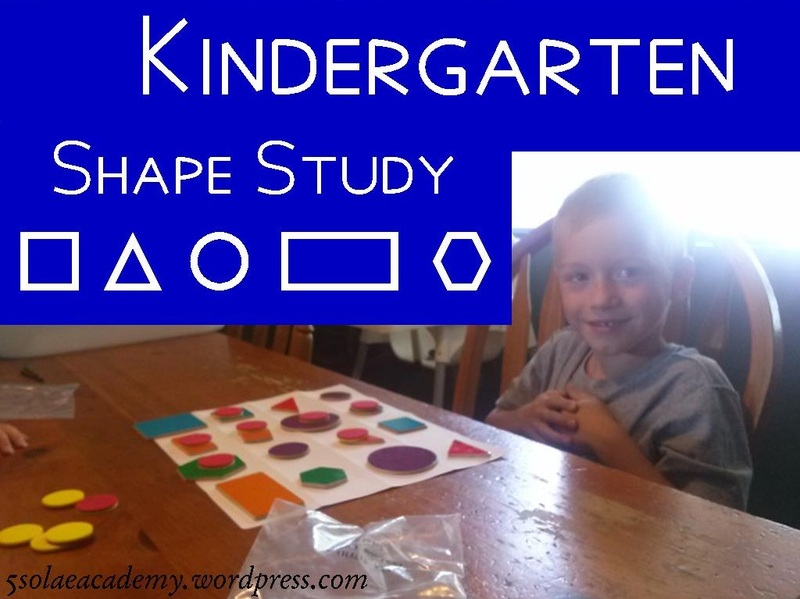 We are starting our kindergarten year with a unit on shapes. 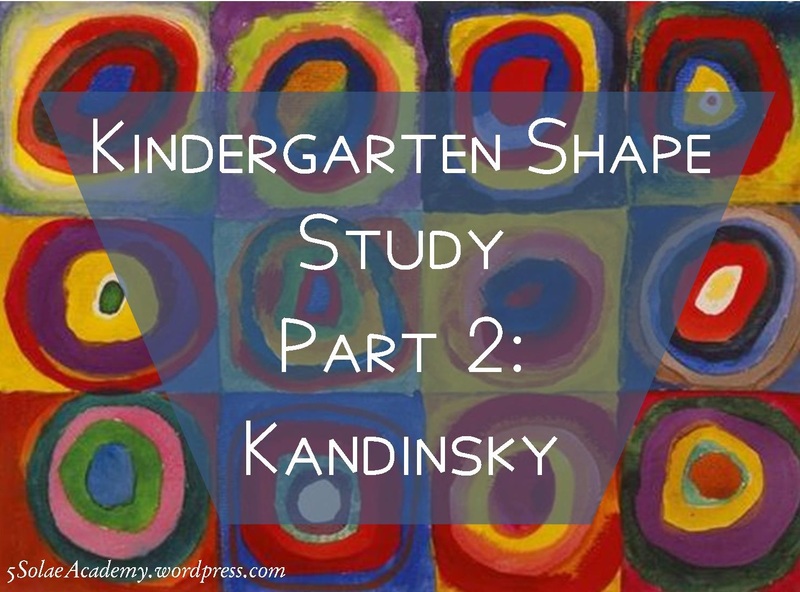 We will do two dimensional shapes first and then three dimensional right after or later in the year depending on where we are at the end of this study. 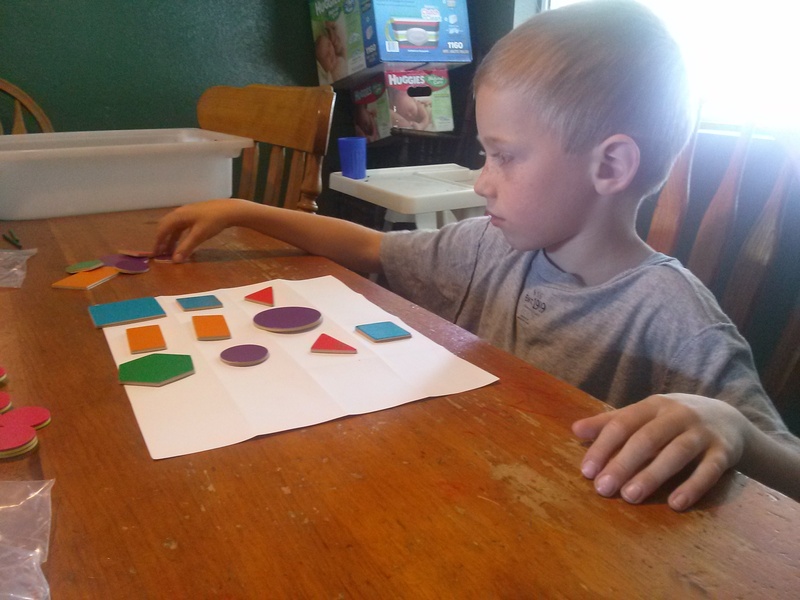 In keeping with my homeschooling on a dollar store budget I picked up some colorful flat wooden shapes on clearance at our local teacher store. There is a section where they have random sets of things that seem like pieces from games for super cheap. 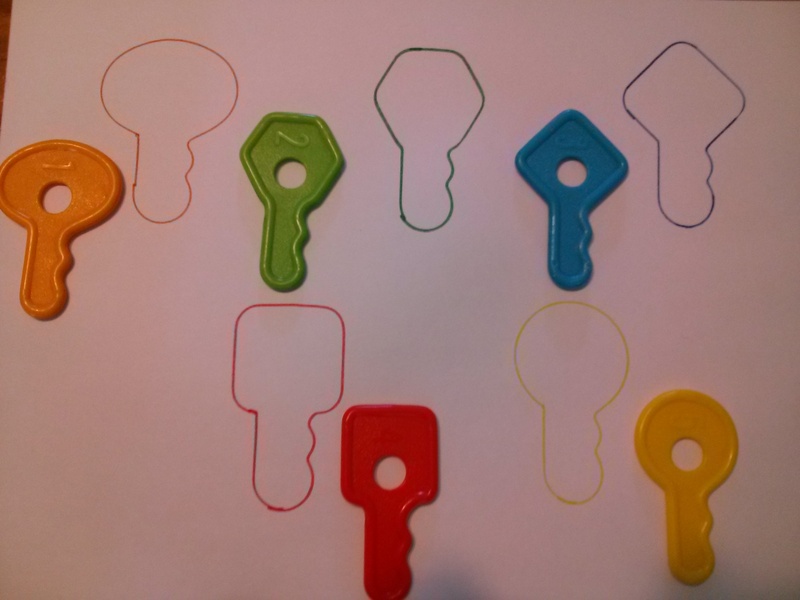 I have found some neat little manipulatives there and always make sure to check it out. For kindergarten we will be doing math twice a week and last week we started by identifying basic shapes, counting sides and corners. 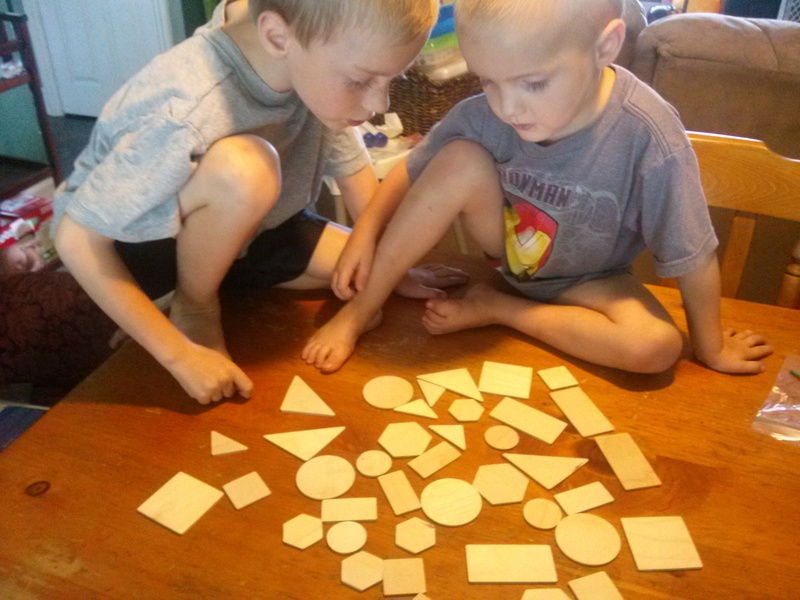 They already knew circle, square, rectangle and triangle but the hexagon was new for them. The first thing I did was have them sort the shapes. They did really well without any input from me. 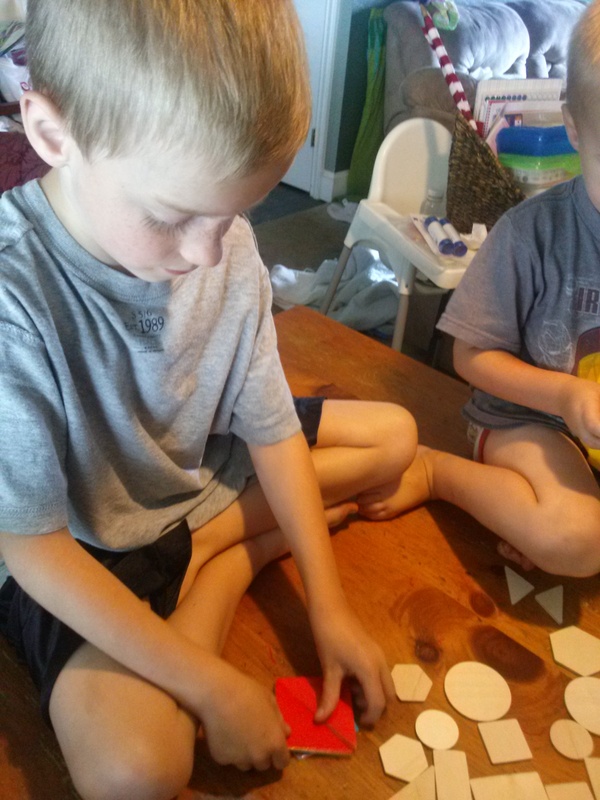 After we had identified each shape and counted the shapes and corners, we played “find me a ___________.” They took turns finding the shape I called out and then each had a chance to call out a shape for the other to find. Next up was the “shape detective” game. 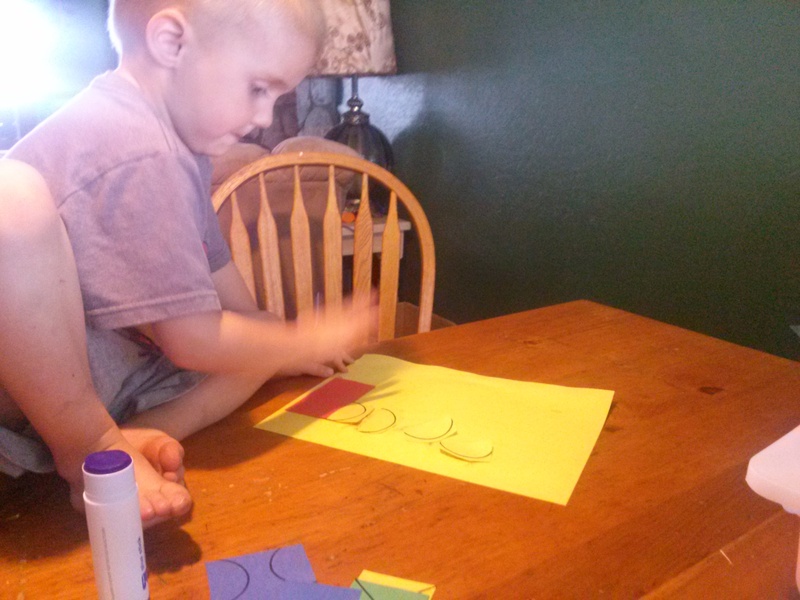 On their turn they chose shapes to put into a bag (I just used a paper lunch bag) and then I told them a shape to find. They had to find that shape using “clues” gathered by their fingers without looking and pull it out of the bag. We started with two shapes and moved up until we had one of each of the shapes in the bag. 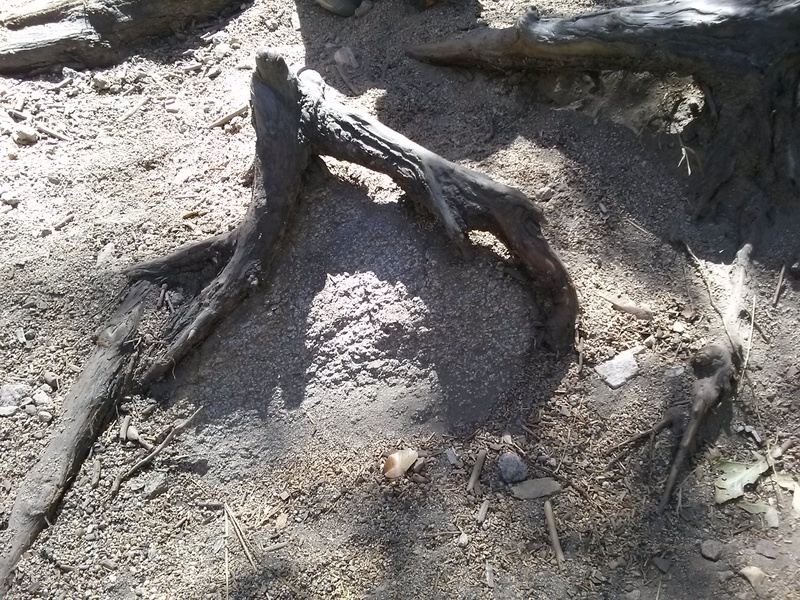 Again, they took turns telling the other what shape to find. Today we continued the shape study by reviewing the shapes we talked about last week. 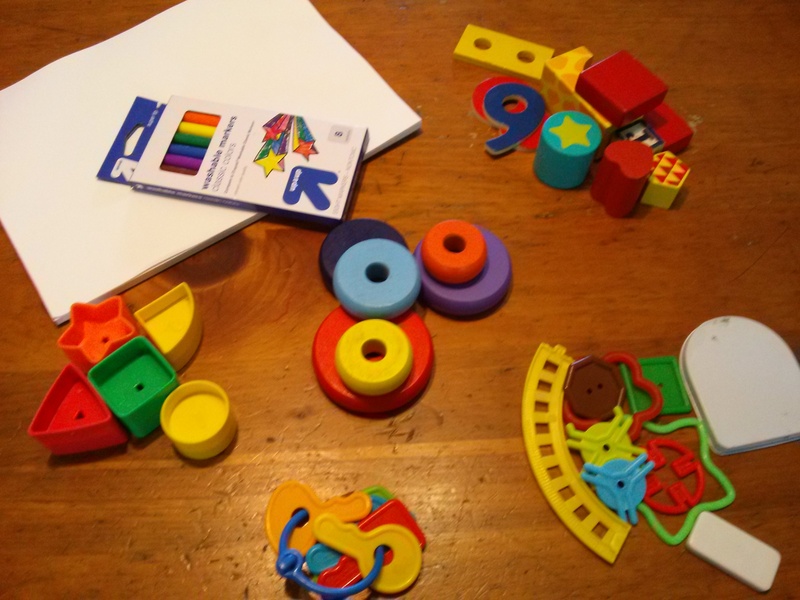 I started the lesson out with the shapes colored side down. 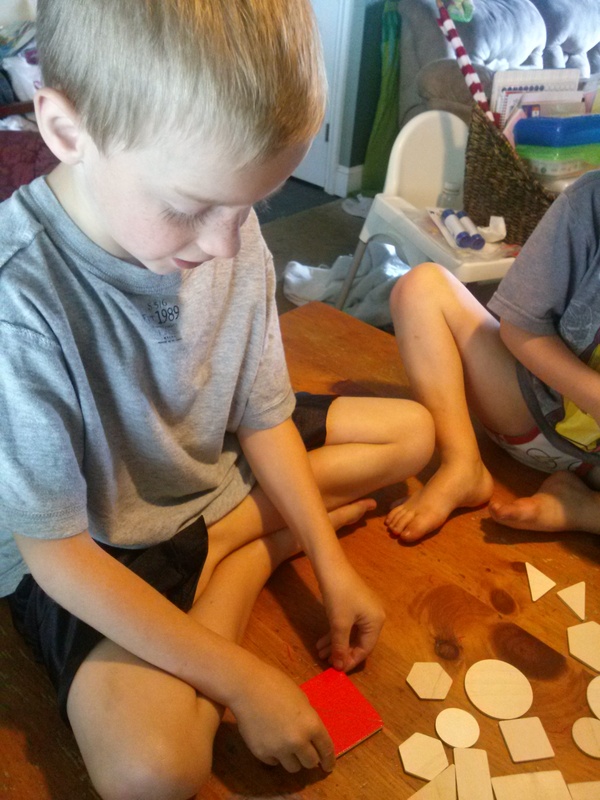 We matched shapes, talked about big and small, discussed how we knew the shapes were different (how is a square different than a rectangle and a circle different than a hexagon even though the shapes are very similar) and discovered that we could make a new shape by putting two shapes together. 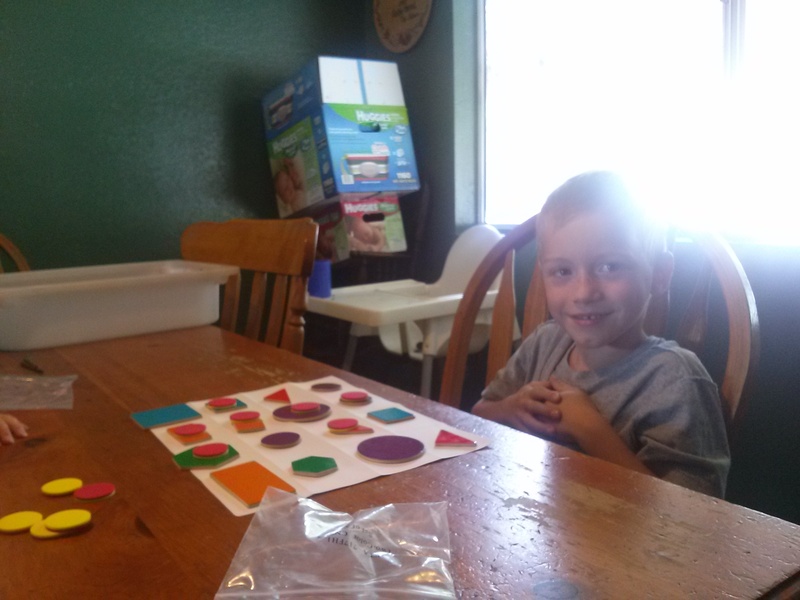 After we talked about the shapes for a while, we played shape bingo. I took a plain piece of paper and folded it into 16 squares. They then filled their boards using the shapes and put a chip on each shape I called. After a few rounds they each had a turn to be the “chooser” and I played one of the boards. The “chooser” had to call out the shape that he chose from the bag. They had a great time with this game and I have a feeling it will be requested again. 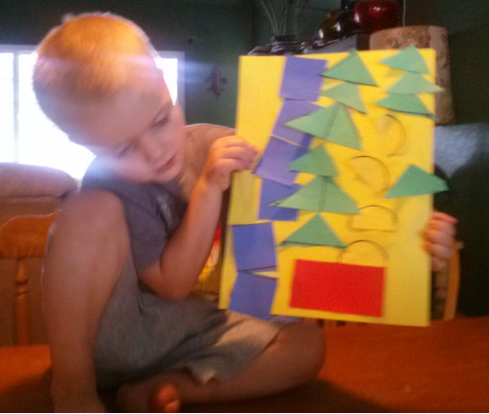 After math, we made shape collages for art. 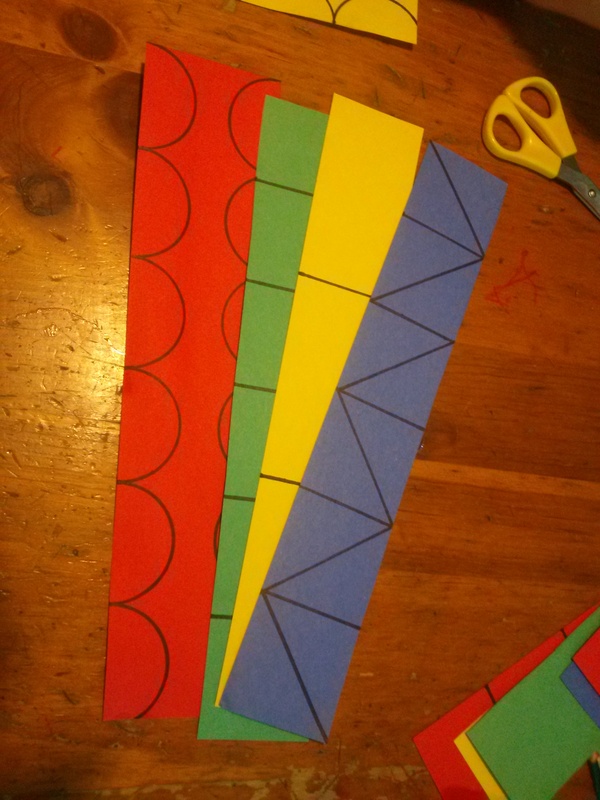 I made cutting strips on construction paper that they cut out and glued onto paper. Cutting the squares and rectangles was pretty easy and the triangles and half circles more difficult. 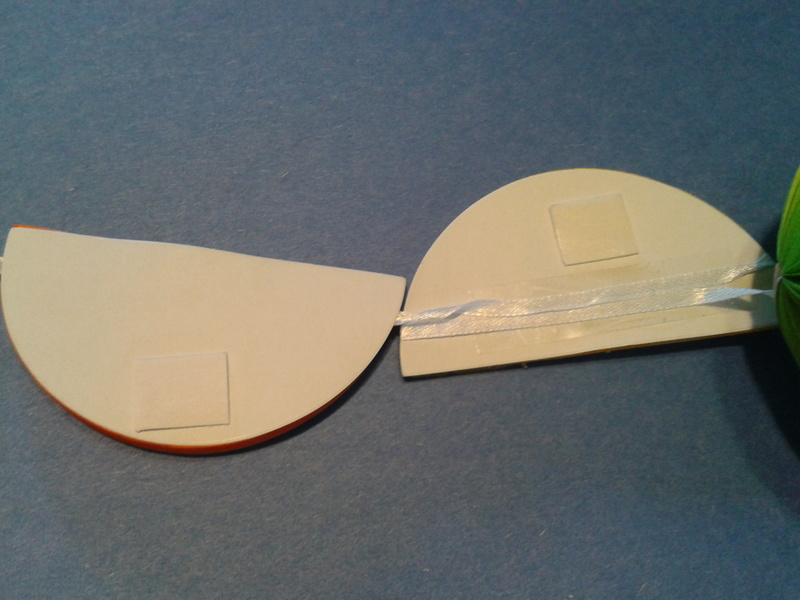 It is quite difficult to cut a circle with scissors, so I decided to use half circles so it was challenging and used the same skills as cutting a full circle but not so difficult that they would become discouraged and frustrated. They had lots of fun cutting and gluing and were so calm and quiet I decided to read the next chapter in our read aloud: The Mouse and the Motorcycle while they worked. Disclaimers: Yes, that is my dining room table full of dents, scratches, missing varnish and permanent marker stains. 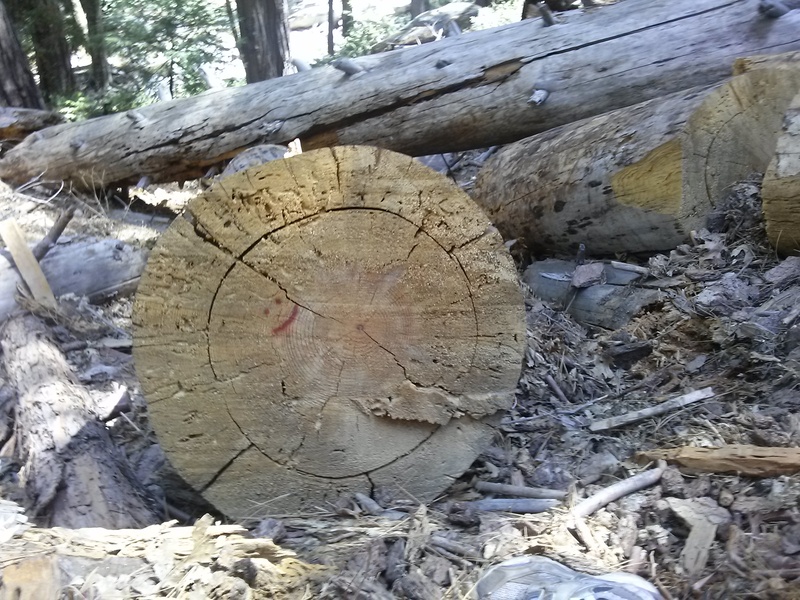 But it is solid and well built and will hopefully last 16 more years of homeschooling and I’m not afraid to mess it up. Also, yes, I know Malachi’s shirt is backwards AND inside out but he is participating so it’s a win. This is real life, my friends. 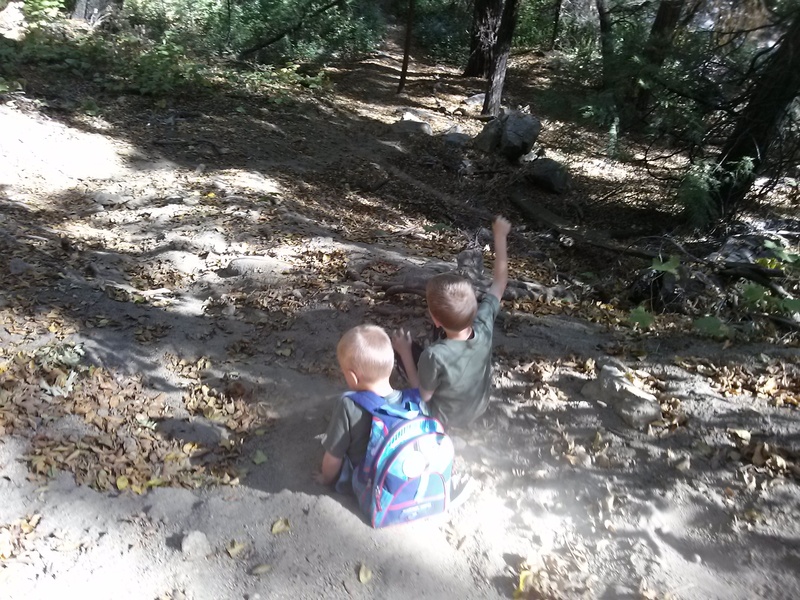 I have posted a little before about our journey to where we are now as a family and our commitment to homeschooling our children even before we were married. 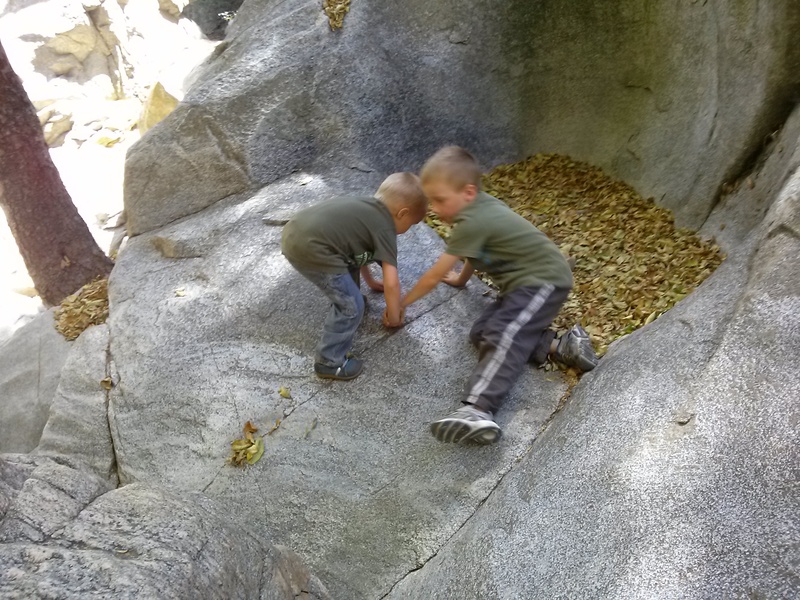 There were many years it seemed we would never see the desires of our hearts, but the Lord knew His plan for us, and following Him has allowed us to homeschool our children. We are so blessed. 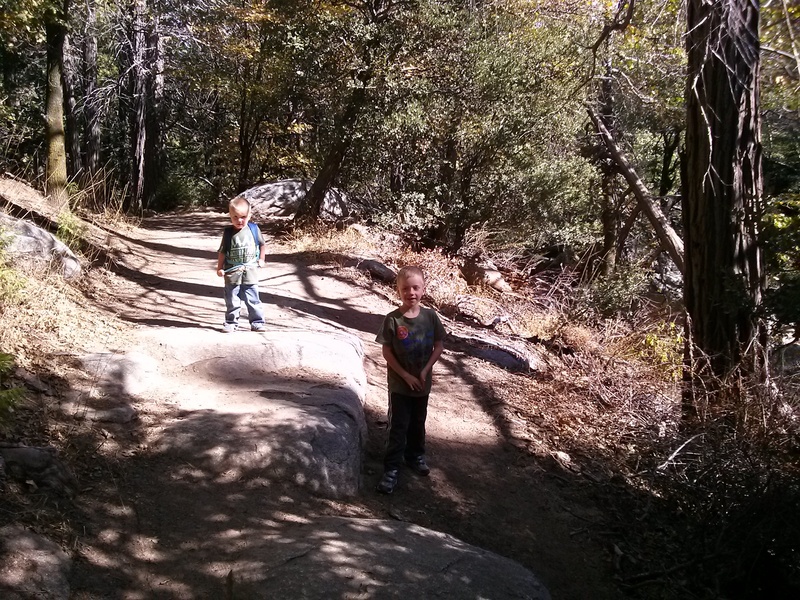 A recent hike with the bigs to a local landmark, Heart Rock, offered reflections on homeschooling and life. 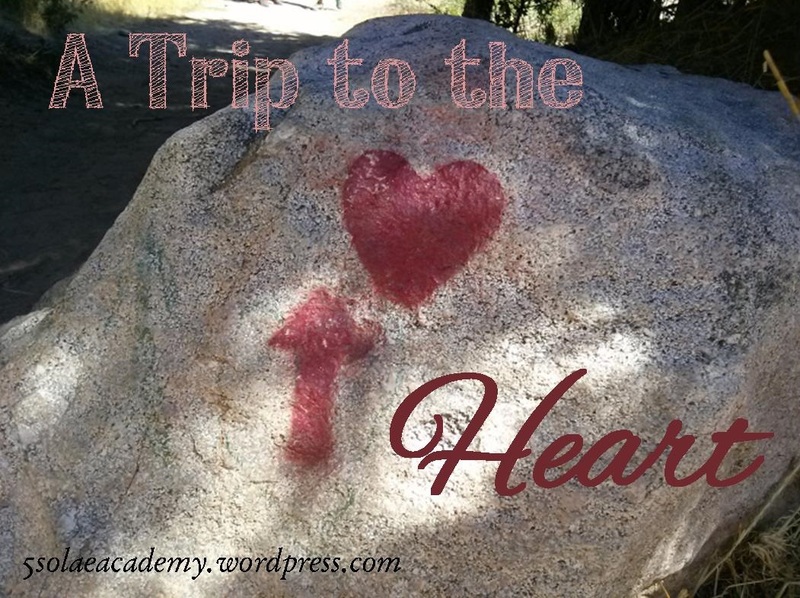 Here is what I hope to keep in mind as we begin our trip to the heart. Some will choose the easy path, some will choose the challenging path. Sometimes the best way to get where you are going is to slide. The lowest point often holds the opportunity for the most growth. We can choose different paths to get to the same place. Look for guidance along the way and keep moving forward. 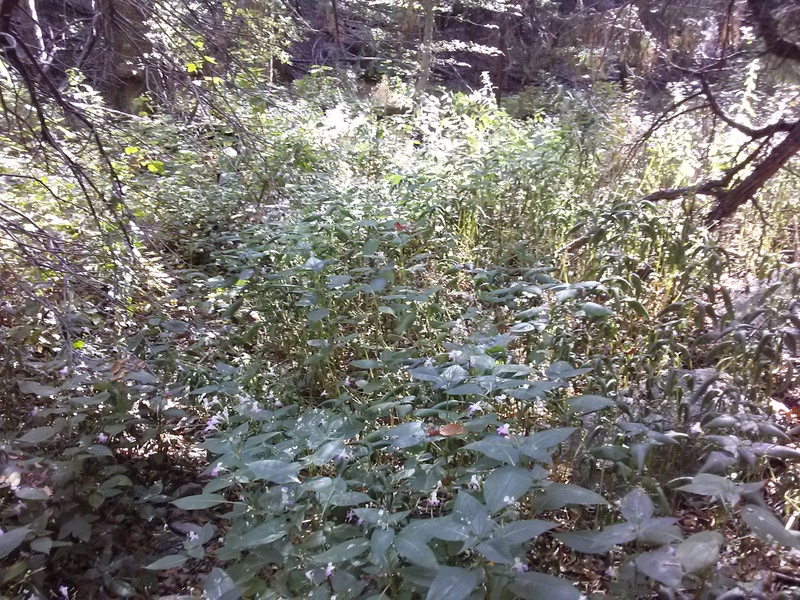 Take risks but remember you may need to backtrack to find the path again. 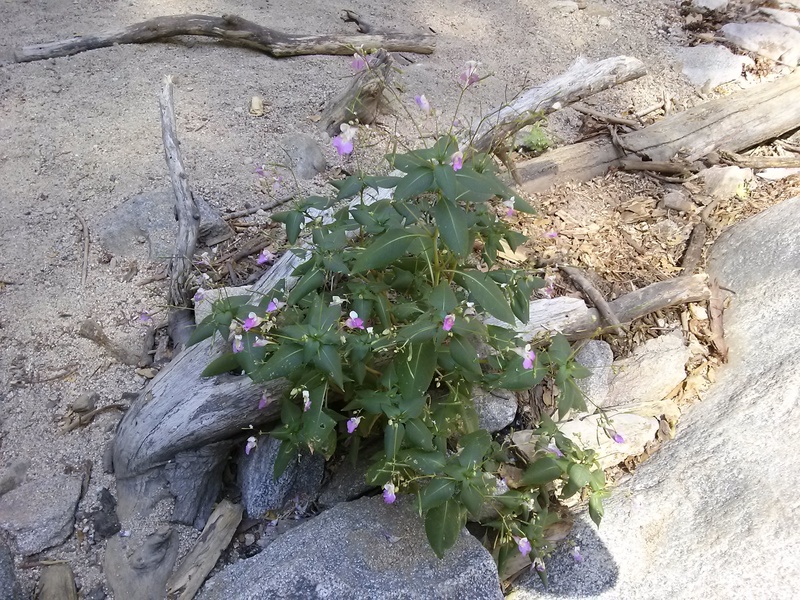 Beauty can come in unexpected places and seemingly impossible situations. Take moments to just be and soak it all in. Every experience is a chance to learn. There is a time to help and a time to ask for help. Find the small moments of joy along the way. Don’t take your eyes off the final destination. Before Cliff and I were even married, we knew that homeschooling was the right choice for our family for a variety of reasons. Fast forward 11-12 years and here we are. Yesterday was the first day of school at 5 Solae Academy! My plan was to have school during the Littles nap to prevent the chaos and destruction that comes with two year old twins, but the boys were so excited I decided to do part of my plan for the day in the morning. First we sorted their new school supplies. I can still remember the smell of new school supplies and the excitement of a new school year that came along with it. I wanted to pass that memory on to my children so I picked up a few new things for them. 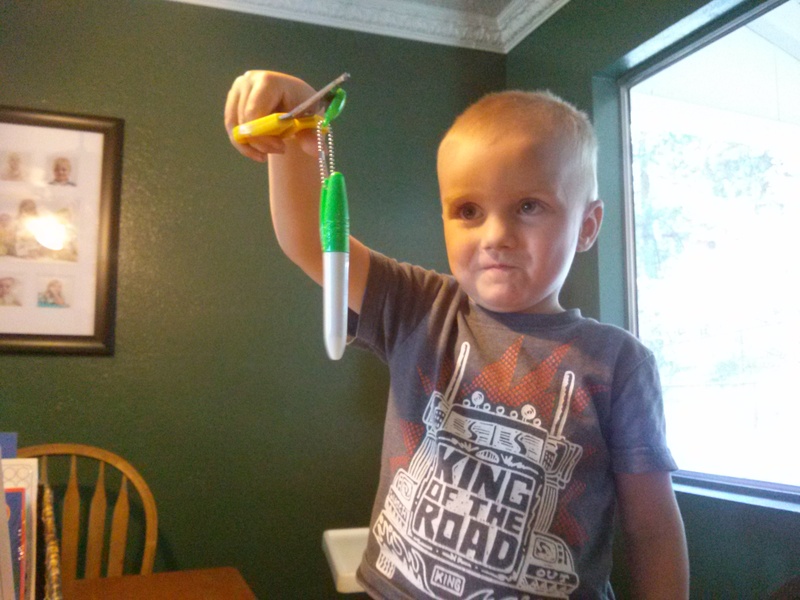 An unplanned lesson on magnets. 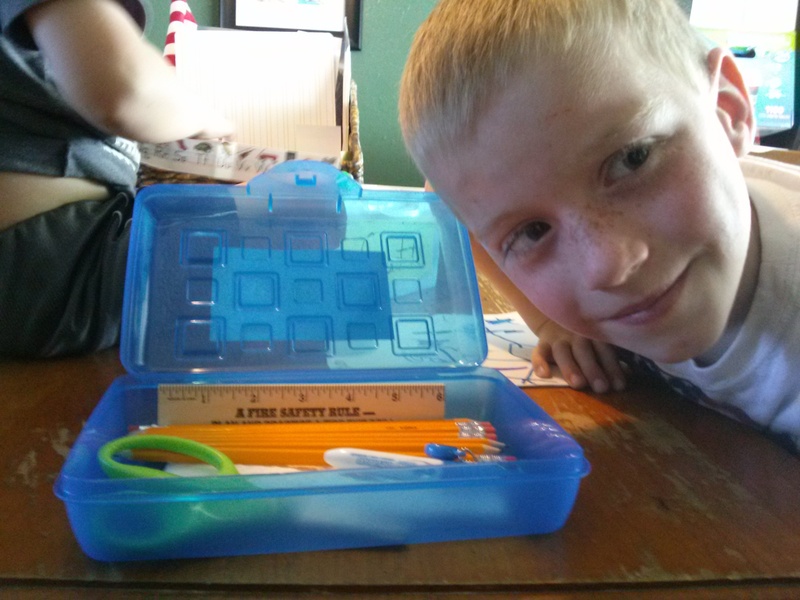 They each have their own pencil case with pencils, a white board marker, (both new), scissors (we already had), a small pack of crayons and a short ruler (both free from the fire department at a recent community fair), a paper towel “eraser” for their whiteboards and a small letter line I made. They also got their own whiteboard and journal. 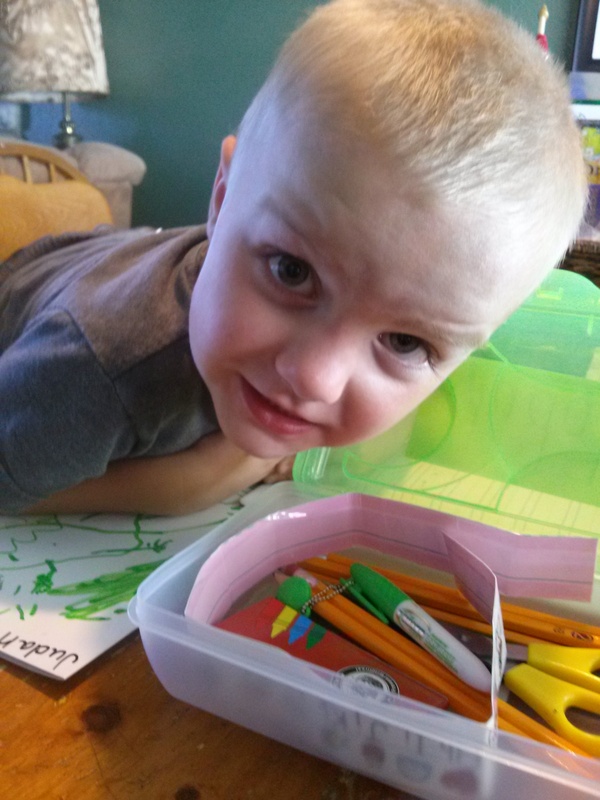 The craft box (a wipe box) has new skinny markers, colored pencils, glue and a bigger box of crayons. After we sorted our supplies, we prayed and recited the Pledge of Allegiance. Then we jumped into reading which Malachi is very excited about and ready for. I am using the book Teach Your Child to Read in 100 Easy Lessons which is a phonics program. We learned the sounds “mmmmmm” and “ssssss.” Malachi said that saying “mmmmmm” was making him hungry so after the lesson we took a break for chips and salsa and my doctor’s appointment. 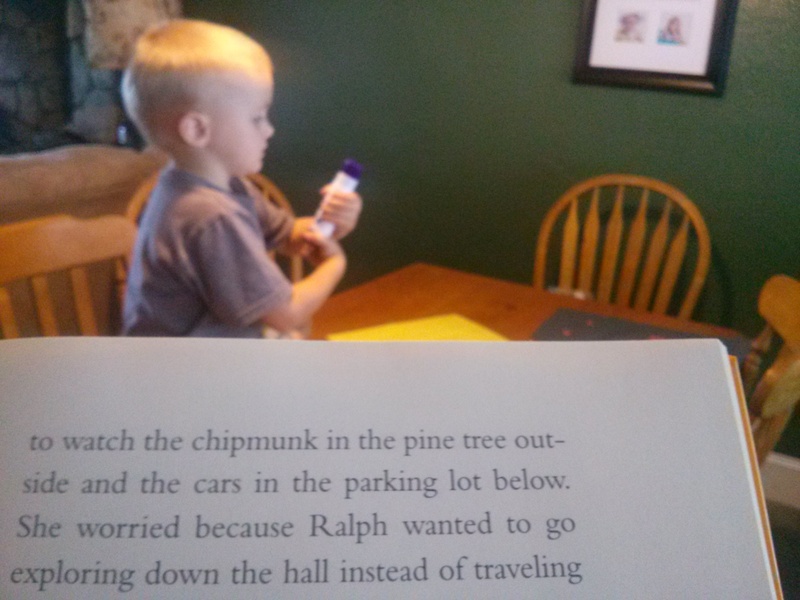 While we were working on reading, the Littles were busy undoing all the work we had just finished despite Grandma’s best efforts to distract them. After my doctor’s appointment, we did our first lesson on science. I am using Discovering God’s World (Abeka) for science. The first unit is “Discovering Myself” and we will be concentrating on the 5 senses. 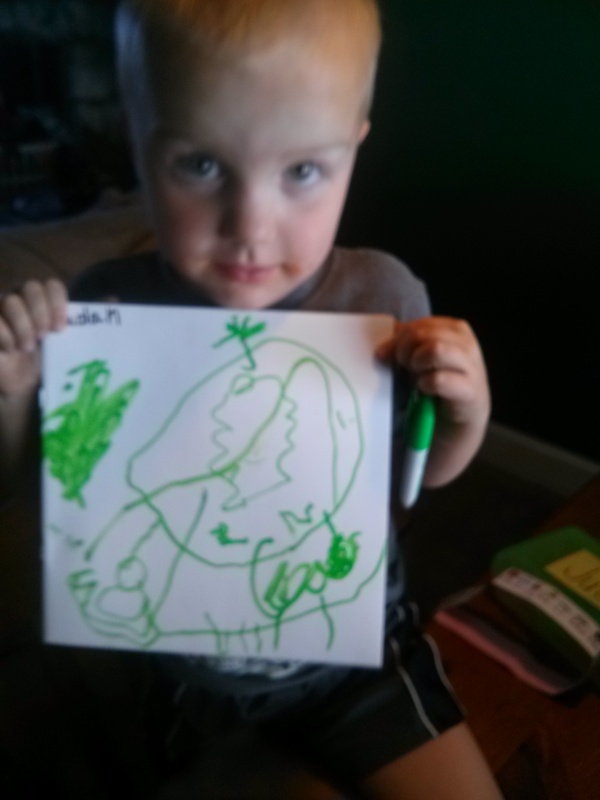 While I read the introduction of the unit, the boys colored pictures of themselves on the front covers of their journals, including brains and in Judah’s case other things 4 year old boys talk about (ahem). We had a few hiccups along the way where Malachi got frustrated, but I found after a few sentences of encouragement, if I continued as planned he recovered and join us again. 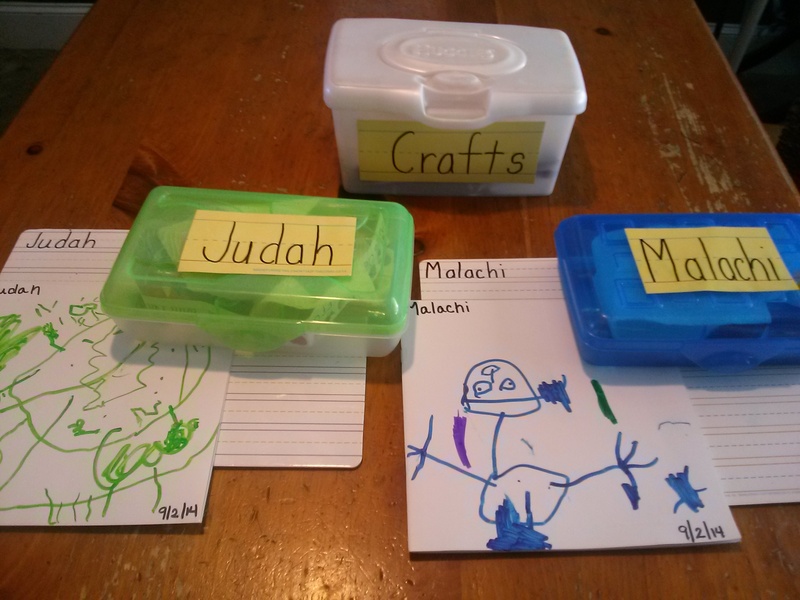 Shortly after we were finished, Malachi asked for more school work (yay!) 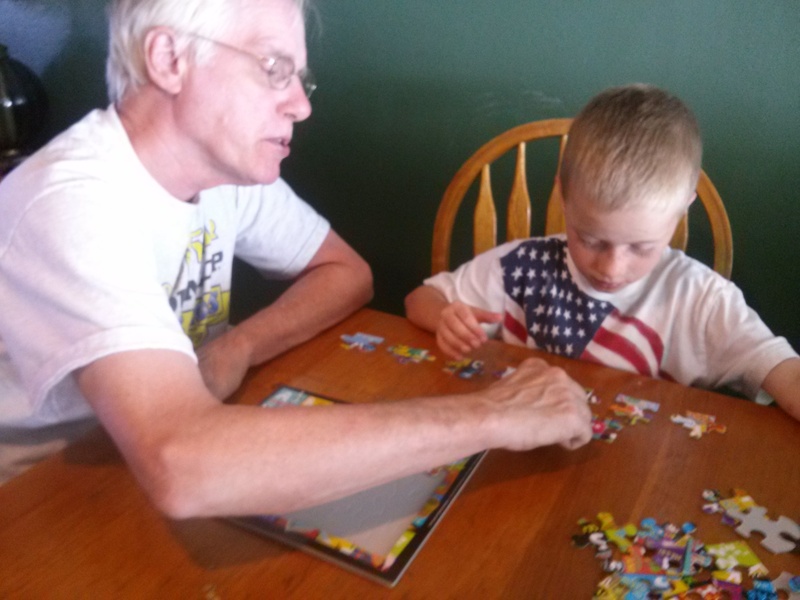 so he practiced writing his name on his white board and did an alphabet puzzle with Grandpa. Overall, it was a great first day at 5 Solae Academy. We are looking forward to 16 more years. If you homeschool, how was your first day? One great thing about having a blog is when you have thoughts running around in your head at 1 am, you can dump them out on a “page” and then leave them there until the morning (well, later in the morning anyway). Then, hopefully, go back to sleep. Here are my 1 am musings. 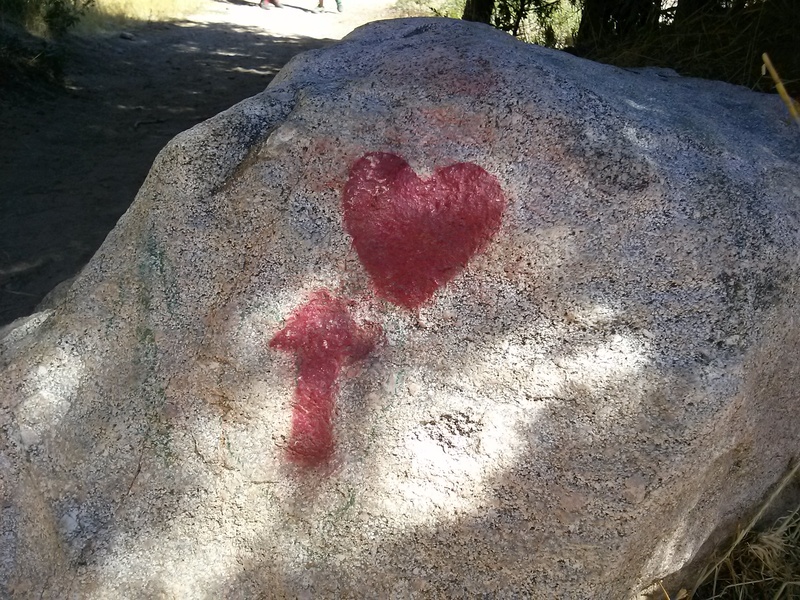 Two things happened recently that prompted this post. The first involves a conversation I had with a dear Christian friend. Her five year old was starting kindergarten at our local public school in a few weeks. I asked her how she was feeling about this. What I meant was “how are you, as a mother, feeling about your baby bird leaving the nest?” It became apparent during the conversation that what she heard was “why aren’t you homeschooling?” She shared her reasons for choosing public school and how others had questioned this choice. I was saddened that she felt she needed to defend her choice to me instead of finding a friend with an ear sympathetic to the bittersweet moments that are ever present in parenting. The second is I joined a very large very active homeschool group on Facebook. The support this group offers is invaluable, yet I am disheartened by some of the things I see there. There are several post everyday along the lines of “I am so glad my children don’t go to public school because….” some of which make me cringe and hope they don’t share those thought outside of the private group. But even more disheartening are the posts (or comments more often) judging other’s methods of homeschooling as if there is a wrong or right way to homeschool. If you homeschool for religious reasons…I support you. If your children attend public school for religious reasons…I support you. If you homeschool for academic reasons…I support you. If your children attend public school for academic reasons…I support you. If your children sleep until 10 am and start “school” sometime between 11-12…I support you. If you do the “get up before 6 am, get dressed, find your shoes, pack the lunch, pack the backpack, run for the bus” dance 5 mornings a week…I support you. 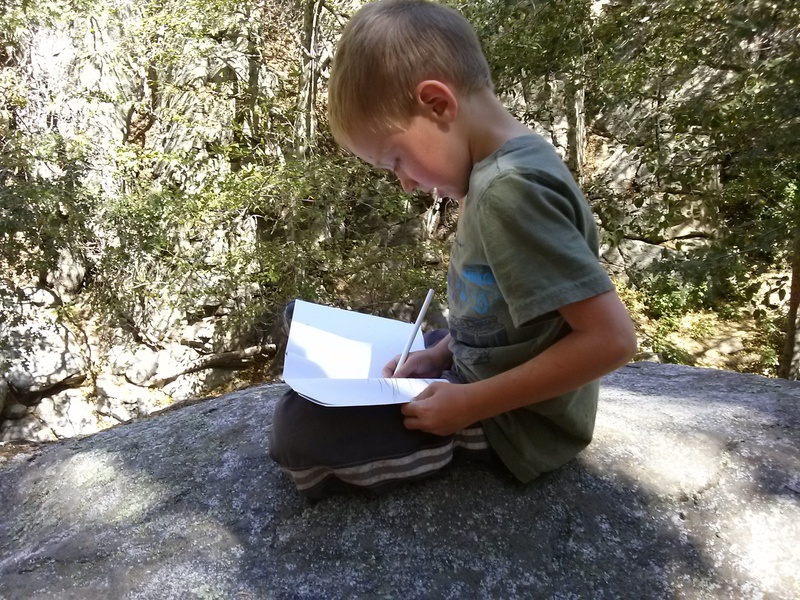 If you homeschool because it makes you a better parent….I support you. If your children attend public school because it makes you a better parent…I support you. If you spend $1,000 on curriculum for your homeschool…I support you. 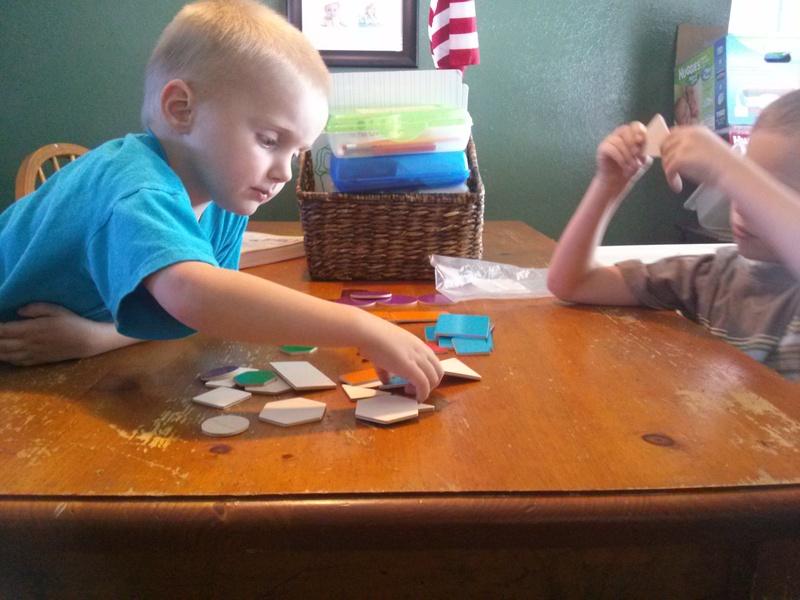 If you homeschool using free resources and Pinterest…I support you. 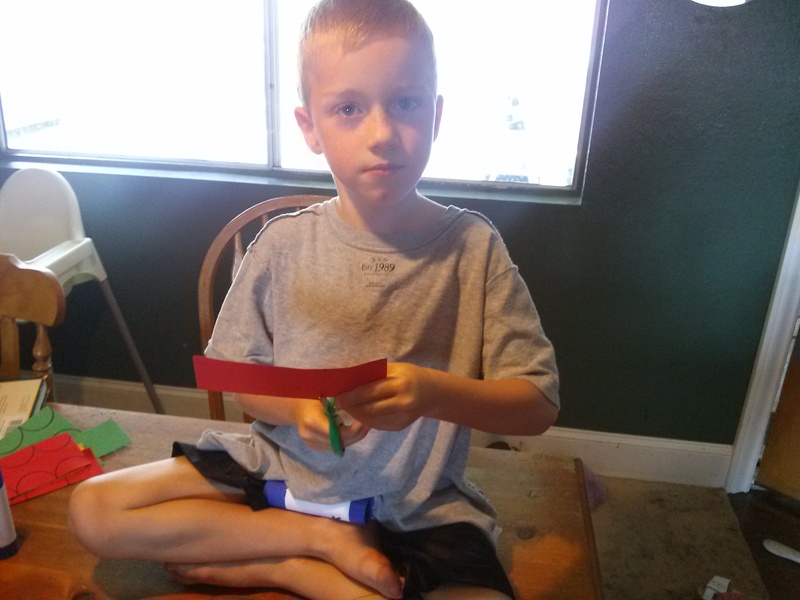 If you homeschool in a designated classroom adorned in primary colors…I support you. If you homeschool where ever is comfiest…I support you. 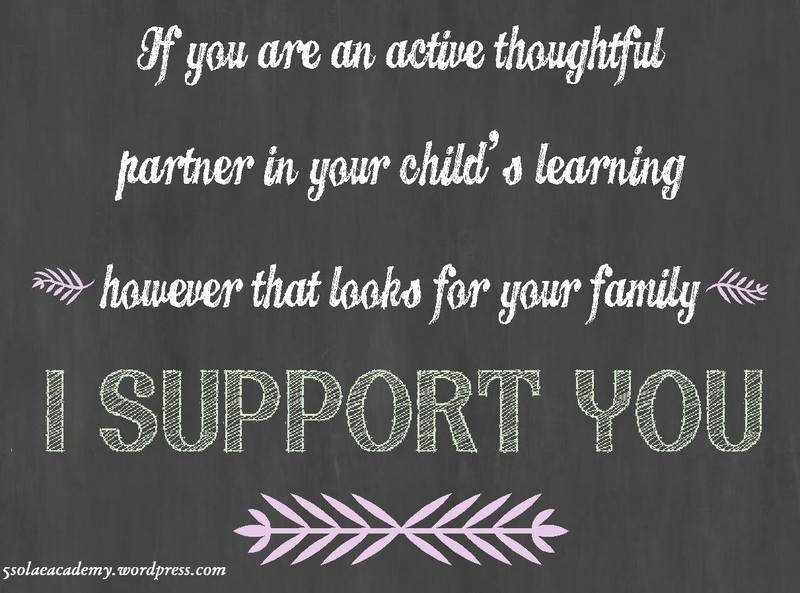 If you are an active, thoughtful partner in your child’s learning, however that looks for your family, I SUPPORT YOU. 1 week until we officially start homeschooling! I have a pretty good start on lesson plans and Malachi just asked me today if we could do reading called “reading” the first day we start school. 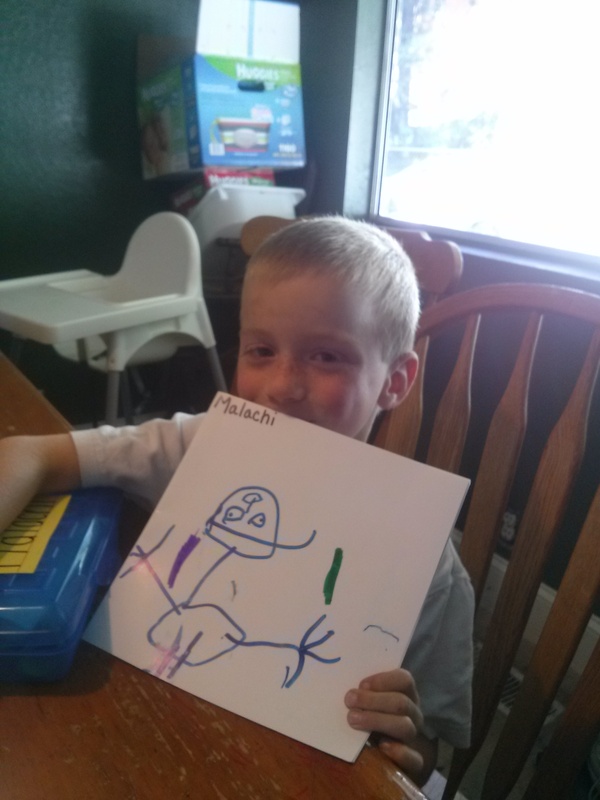 I wasn’t planning on jumping right into phonics on the first day, but he is SO ready and willing how can I say no? Two year old twins means I need lots of “stuff” to keep them busy while I teach the older kids. 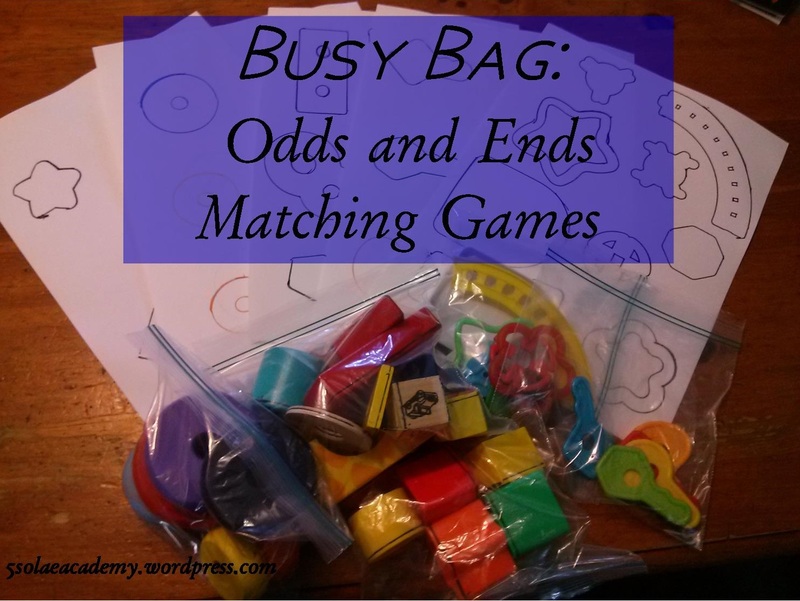 This week will be all about busy bags for the littles and independent activities for the bigs. All the activities must fit into my “dollar store budget” which means a lot of DIY and using things I already own. Last week, I did a giant purge of the bigs’ bedroom which is basically a playroom. I sorted every toy into one of three piles: keep (the smallest), donate/sell (the largest) and trash. 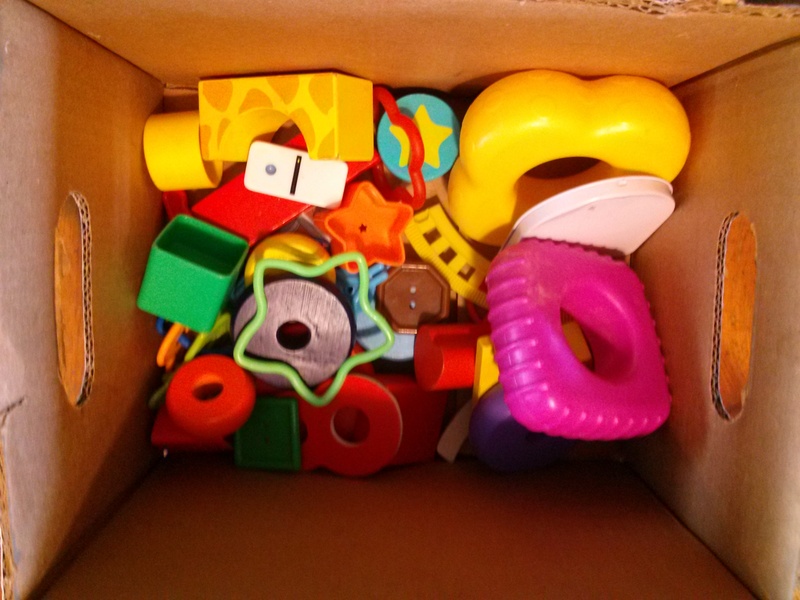 As I was sorting I kept out some small odds and ends that I could use for sorting and matching puzzles. These were mostly items that were originally part of larger games which were unusable because the other pieces were missing or broken. I sorted them into groups of like items to make the matching games. 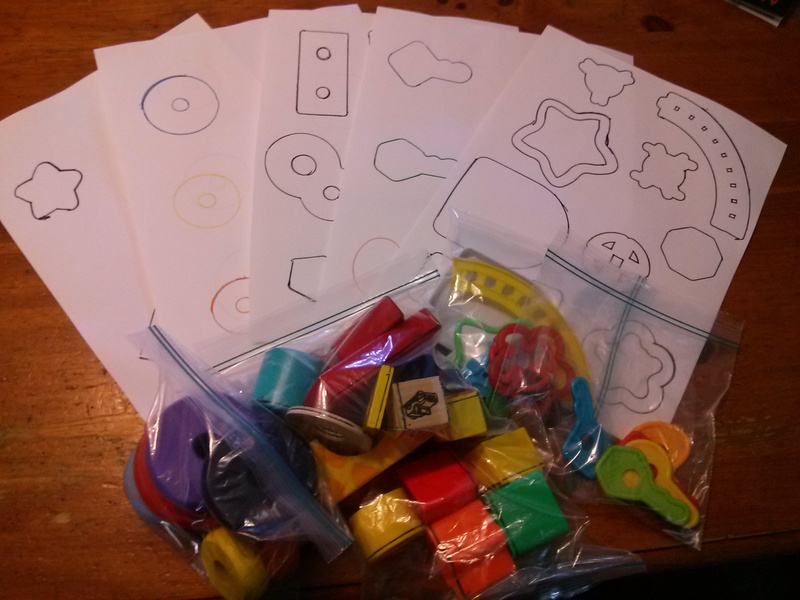 I tried to make sure I would have easier games for the littles and harder games for Judah, my lover of puzzles (and the littles as they grow). I also broke out the new pad of white craft paper and brand new markers. One great thing about homeschooling is I get to use the new school supplies too. Several of the games I made two sided. On the games below, one side is self-correcting by color; the shapes were traced in the same color as the object. The other side is more difficult with all the shapes traced in black. After 20 minutes or so of tracing, I now have 8 games (3 pages are double sided) for my busy bag boxes. 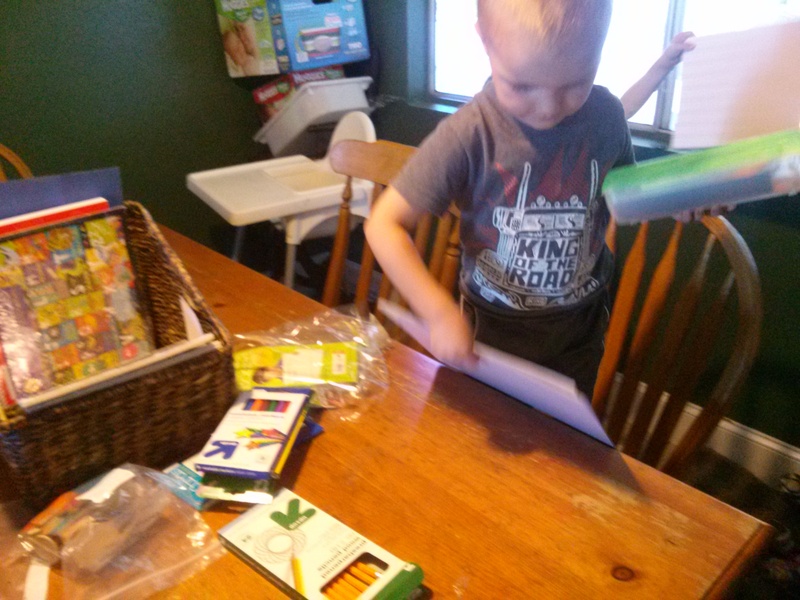 What are your best homeschooling on a dollar store budget tips? I recently asked on couple of homeschooling Facebook groups about vision/mission statements and did not get a huge response. I am sure it is not because families don’t have a vision for their homeschooling but instead that they don’t have a written statement. 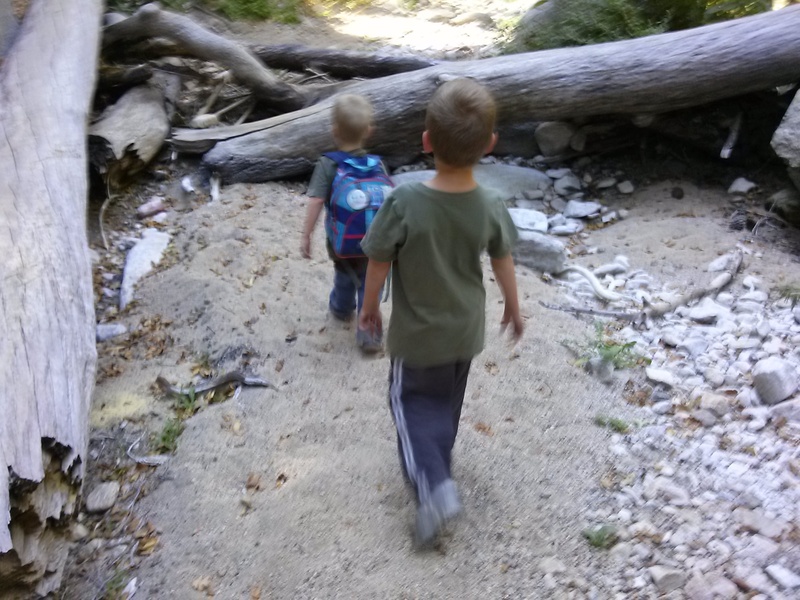 If I asked any homeschooling family these questions: Why do you homeschool? Why is it important to your family? 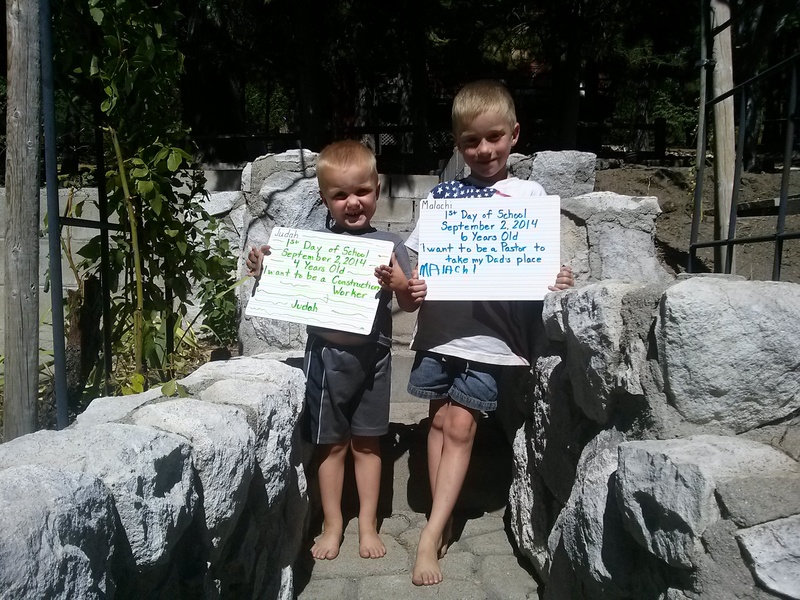 What do you want homeschooling to accomplish for your children? they could tell me. That is their vision. For our family it is important to a have a written statement that will hold a prominent place in our home. Switch out organization with family and employee with family member and you have 4 great reasons to write a homeschool vision statement (or a family vision statement if you are not a homeschooling family). Defines the optimal desired future state – the mental picture – of what a family wants to achieve over time: The ultimate goal of parenting is to “[t]rain up a child in the way he should go; even when he is old he will not depart from it.” (Proverbs 22:6) Though it is very easy to get caught up in the minute by minute “crisis management” that parenting, especially with young children, can feel like, our eyes need to be focused on developing our children into adults who have the tools to achieve their fullest potential. Those tools are not only academic; they are also social, spiritual and mental. How many times have you heard of someone with a community college degree or no college degree managing an employee who graduated from an Ivy League or prestigious university? Why does this happen? Because success depends on multiple factors including social abilities, problem solving skills and confidence in a variety of situations and with a variety of people. A vision statement should look beyond academics to the tools our children need to be successful adults. 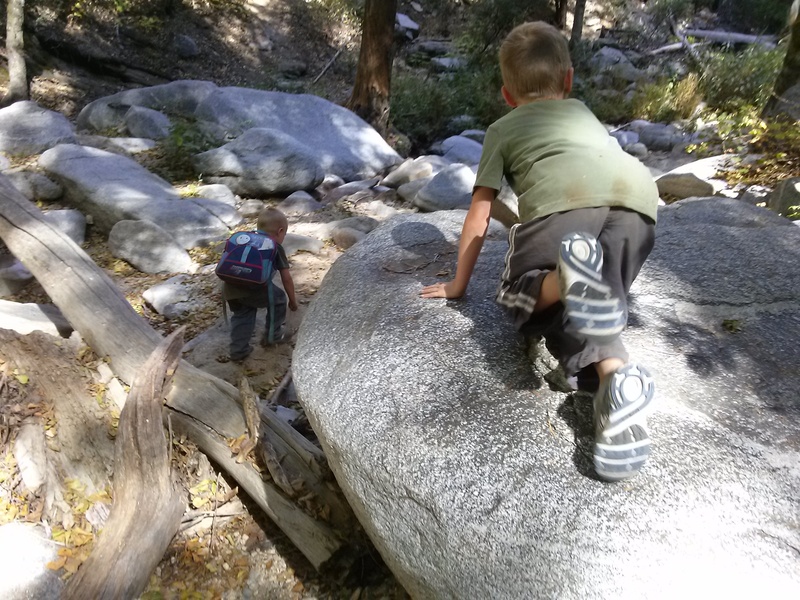 Provides guidance and inspiration as to what a family is focused on achieving in five, ten, or more years: This will be my first year homeschooling and as my youngest are two, I am looking forward to 16 more years of homeschooling. In the homeschooling world where families often homeschool all of their children from preschool to college and large families are not unusual, 16 years is a short time. For some families, homeschooling may be short term (1 year, preschool and kindergarten only, elementary school only) but that does not negate the importance of having a vision for family life. In developing a vision statement, we need to be looking for long term goals and asking ourselves: what do we want for our children as they enter the world after their education? Where will our focus be in the coming years? How will we achieve our goals? What will inspire and guide us? This is different than short term yearly goals (which may include things like, read a book, learn multiplication, or write an essay). Hopefully this vision statement will be as applicable, true, and inspiring in 5, 10 and 16 years as it is now. Functions as the “north star” – it is what all family members understand their work every day ultimately contributes towards accomplishing over the long term: For now, the family members doing the majority of the work are Cliff and I but over time that will change. Our children will be held responsible for chores, completing school work independently and impacting our home environment among other things. Holding Scripture as our foundation and glorifying God in all we do will make straight our paths (Proverbs 3:5-6). It will direct our interactions and the choices we make. We already talked about long term goals, now we must ask how will our daily work (housework, school work, church work, etc) contribute to those goals? A vision statement must set the standards by which we treat each other and accomplish our daily work. Is written succinctly in an inspirational manner that makes it easy for all family members to repeat it at any given time: A vision statement should be short, a sentence or two at the most, which inspires your family to do better and be better while keeping the long term goals as the focal point. I plan to hang ours in a prominent place in our home where we can be reminded of and inspired by what we are trying to accomplish with a quick glance. 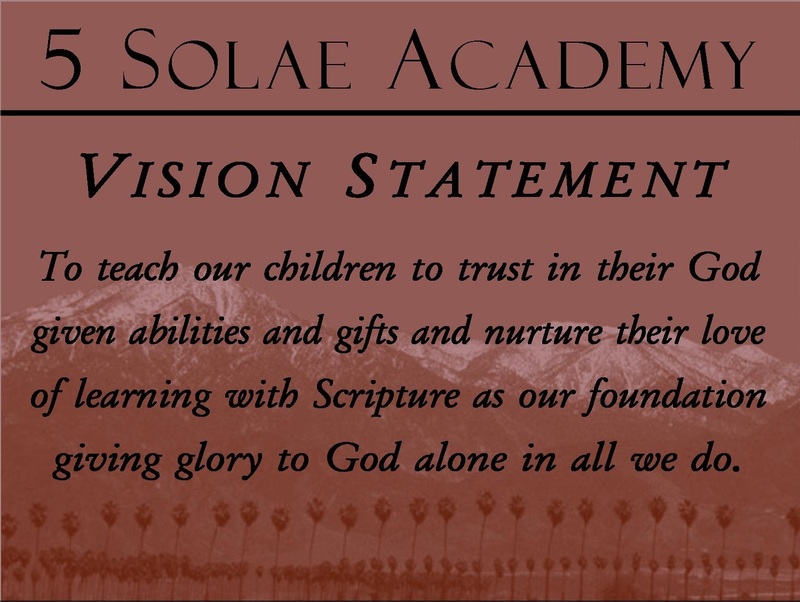 Do you have a vision statement for your homeschool or family? I would love to hear it. If not, do you think the development of a vision statement would clarify your long term goals and provide inspiration for your daily work? Let me know what you think below. I am a tea drinker and for years, I have wanted a beautiful Japanese teapot. Every time I go into a tea shop I ogle and caress the cast iron pots. Yesterday, my parents surprised me with the butterfly and cherry blossom decorated teapot in the picture above. I am so enamored with it I just had to share a picture with you. 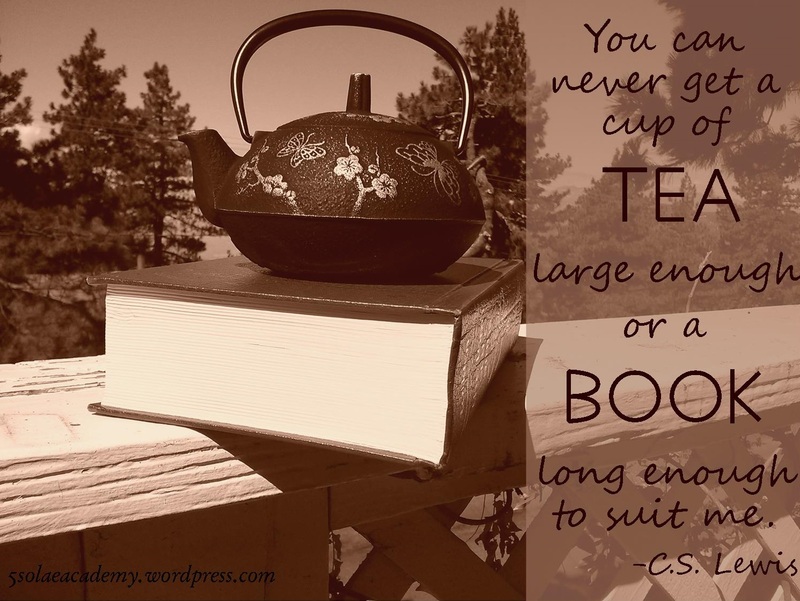 And what better to go with a teapot, than one of my favorite quotes. Honestly, I don’t know how I do it either. My house is a mess more often than not. Laundry lives in baskets, clean or dirty (not usually together). I am often too exhausted to think of anything new for dinner so we eat tacos, fajitas and pan fried chicken every week. Once in a while I change things up and make spaghetti sauce in the crock pot. This morning I was sorting piles of toys for the 1000th time switching out upstairs and downstairs toys. Eden was standing on the block table I had just brought down instead of being thoroughly engaged in the “new” toy like she was supposed to be. I guess 2 year olds don’t read parenting books and blogs. Suddenly, in my mind I was transported 30 years into the future. I saw myself sitting on the couch watching TV I was only mildly interested in, missing the noise and chaos I am now in the midst of. Then I was transported back 10 years ago when all I wanted was to be a mother. I was moderately obsessed by motherhood, though I wasn’t one. I read parenting magazines and blogs and joined online parenting forums. I was reminded that I am, right at this moment, living the life I always dreamed about and prayed for. Being a stay at home mom is the hardest job I’ve ever had. The first two years I was a mother, I also worked full time. For me that was easier. Motherhood is a 24/7 job, there is no doubt about that and staying at home means that often there is NO break from your job for days. I was very sick while pregnant with the twins and the first year of four children under 5 was extremely difficult. I felt as if I was simply surviving from the time I woke up until I went to bed (with the kids). The truth is I couldn’t. I still can’t. None of us can get through one moment of any day without the grace and mercy of God. Children are clearly a blessing. (Behold, children are a heritage from the LORD, the fruit of the womb a reward. Psalm 127:3, ESV) Yet, the Lord used these blessings as disciplines to break me down and bring me to the point where I have no choice but to be wholly dependent on Him and leave myself behind. He gave me everything I wanted and had prayed for (4 children, becoming a SAHM,homeschooling, even the community and Church where we live and worship are answered prayers) but He gave it to me in a way that broke me. Within one year, we moved from Chicago to Southern California where we didn’t know anyone, I changed from working full time to staying at home full time, we purchased our first home, Cliff became a full time solo Pastor, and then I found out I was pregnant and with twins no less. All of my prayers answered in one year. Whew, what a whirlwind. It broke me, in a good way, in the way He intended. Every morning I wake up knowing I cannot not make it though on my own, under my own power. I also know that I don’t have to. I have to place it in His all powerful hands and trust Him to pull me through. That doesn’t mean all my days are easy and I am the perfect mother, far far from it. But I rest in the knowledge that I am living the life He intended for me even when I am asking, why me? 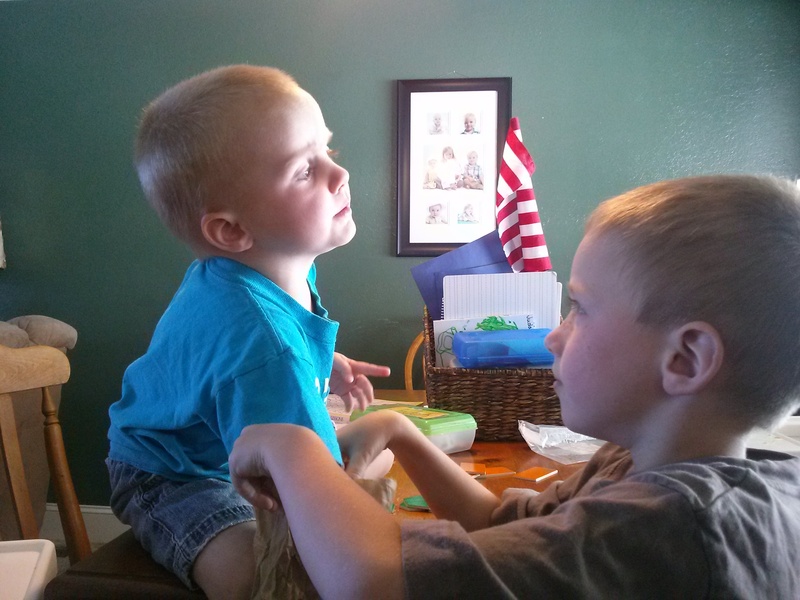 So faced with the prospect of homeschooling with two year old twins, I ask “How can I do this?” The answer is I can’t. What I can do is rest in His plan for my life and my children’s lives. 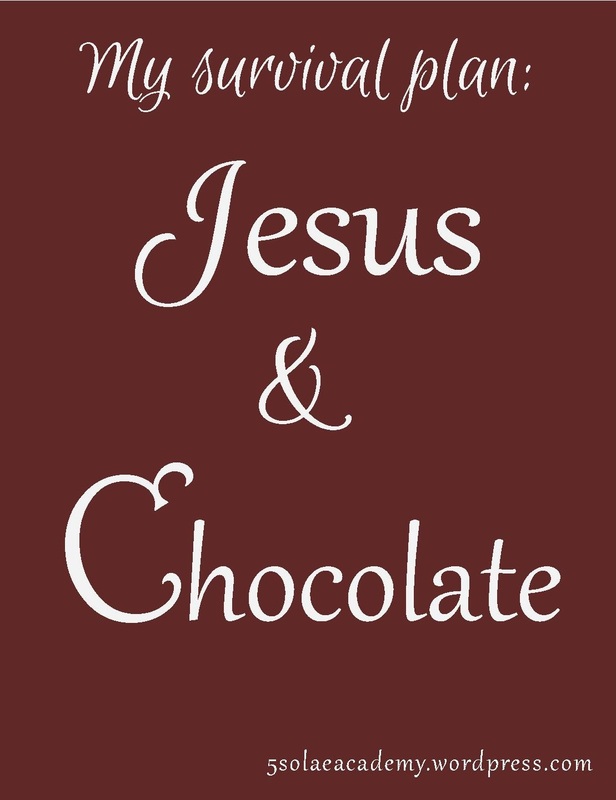 And eat chocolate, lots of chocolate. Has the Lord used blessings as disciplines to form you into the person He wants you to be? My babies are 2! I have heard dozens of times that when you are a parent, time goes by too fast. With my first, baby, Malachi I didn’t really see it. 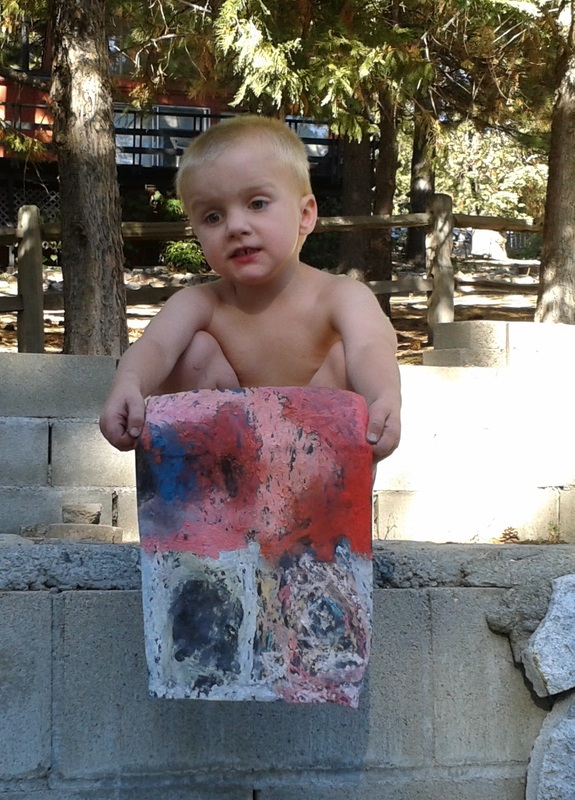 I distinctly remember when he was nine months old not understanding what everyone was talking about. I still don’t really feel that way. Yes, he’s getting older and I miss when he was a baby (especially those days when he wakes up with an attitude as big as our mountain) but his age seems to be moving along as it should. This is not true with Eden and Asher, I feel like time is flying by and I am desperate for it to slow down. Maybe because they are my last babies and I know that each moment, each phase will be my last. Maybe because they are children #3 & 4, twins no less, and I am so busy time can’t help but fly by. Whatever the reason, they are two and all too soon. Despite how we may feel, time marches on, birthdays come and our children get bigger and older. But birthday means party! I decided to do a shared party with a friend from church who is almost exactly one year older. We don’t have a theme, which in the time of Pinterest seems almost unthinkable, but the cake we chose has a caterpillar on it. 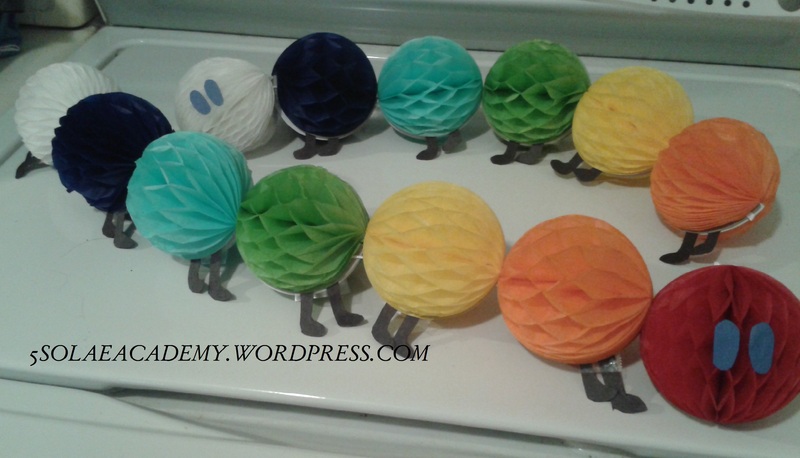 So I wanted to make an inexpensive caterpillar decoration. I went to Hobby Lobby (yay!) to find inspiration. I had several thoughts, tissue paper balls, Christmas ornaments (yes, Hobby Lobby has Christmas decorations out in August), fabric covered styrofoam balls. But none of them was just right. A week later I was in Target looking at party decorations and favors. 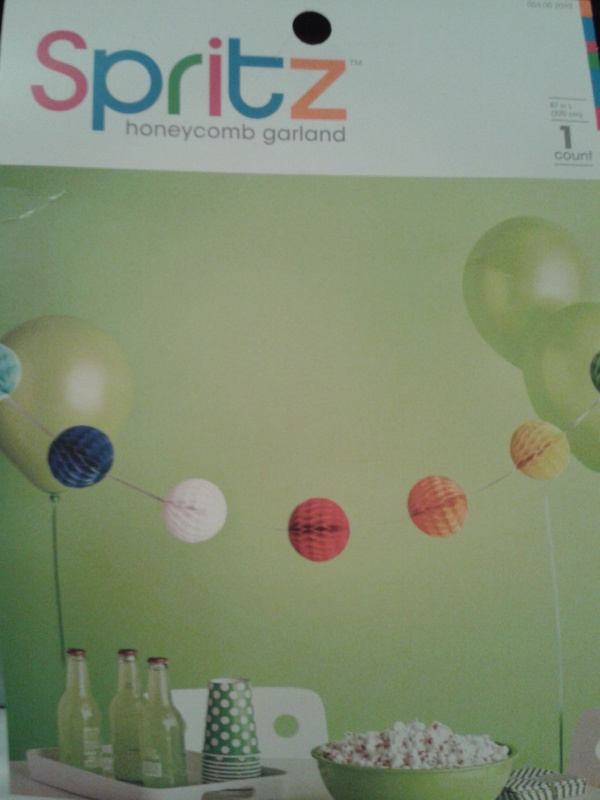 When I spotted this I knew I had found what I was looking for: inexpensive, primary colors and so cute. Now I needed to change a garland into a caterpillar. The garland was held together by white ribbon and while I didn’t want the ribbon to hold the balls apart, I did need it to connect the balls. So I left the ribbon intact and used double sided tape to hold the ribbon to the back of each ball. Luckily, each section of ribbon was the same length as the ball. Because of the way the ribbon was originally attached I found I had to tape two pieces of ribbon to every other circle. Confusing? I took some pictures to show how I taped the ribbon. Since the colors repeat, I decided to cut it in half and make two. 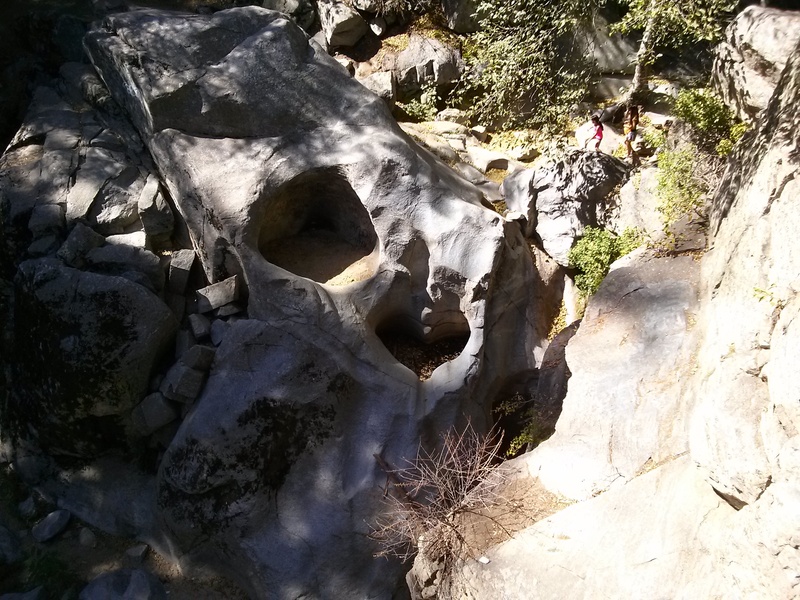 When I had the balls attached close together, I needed feet and eyes. Scissors, construction paper and more double tape and two caterpillars were complete. 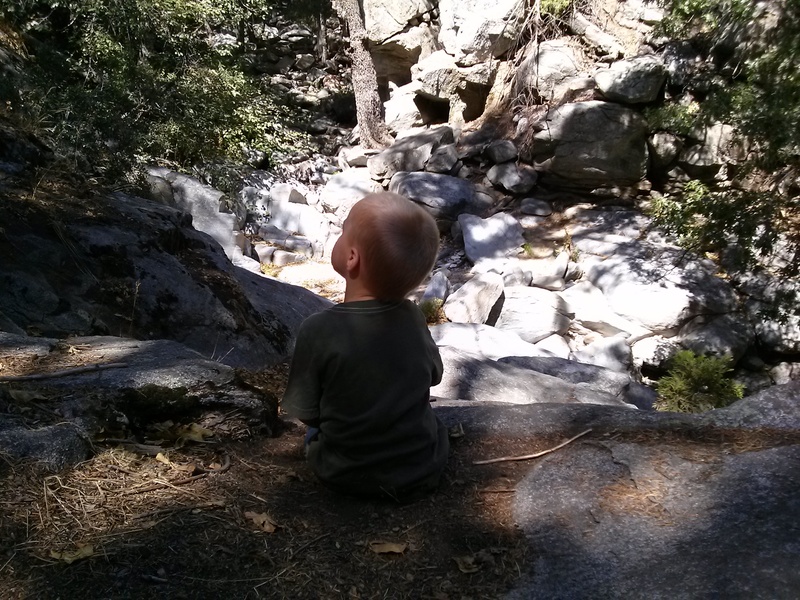 Do you find that time moves faster with your younger children than with your first?